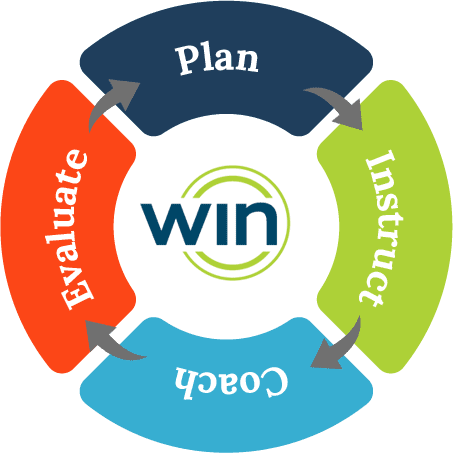 WIN Learning's professional services model is based on current research, collaborative implementation planning, and a comprehensive professional development approach with effective coaching support and frequent progress monitoring. As a long standing industry leader in the design of career-infused educational courseware, WIN Learning remains committed to creating successful partnerships to further the common goal of preparing learners for career and college readiness. By combining high-quality educational software with extensive consulting experience, WIN Professional Services brings years of consulting and teaching together with real-world expertise to provide exemplary services and support. The WIN Implementation Model encompasses the “events” outlined in the implementation cycle, and provides a road map in the development and execution of an implementation plan designed to ensure the successful integration of our award-winning tools. WIN Professional Services begins when a customer’s program goals are clearly defined and continues throughout each phase of planning, instruction, support, and evaluation. This cyclical, blended learning approach ensures the consistent and effective use of all WIN tools and delivery of services that positively impact teaching and learning in a career and college readiness environment. Determine program goals and implementation timelines for the successful integration of all aspects of WIN Career Readiness Support. Conduct onsite / virtual sessions for instructors, site providers, and program administrators. Contact sites on quarterly basis as a follow-up to initial training to reinforce concepts and shared learner success. Meet with implementation partner to ensure results are aligned to program goals. Monitor and adjust ongoing. Need Implementation or Technical Support? Contact our support team for immediate assistance or to inquire about WIN Learning Professional Services.